Monument to Cervantes in the Plaza de Espana, Madrid, with bronze statue of Don Quixote and Sancho Panza in front. Many countries have their own special folk hero. 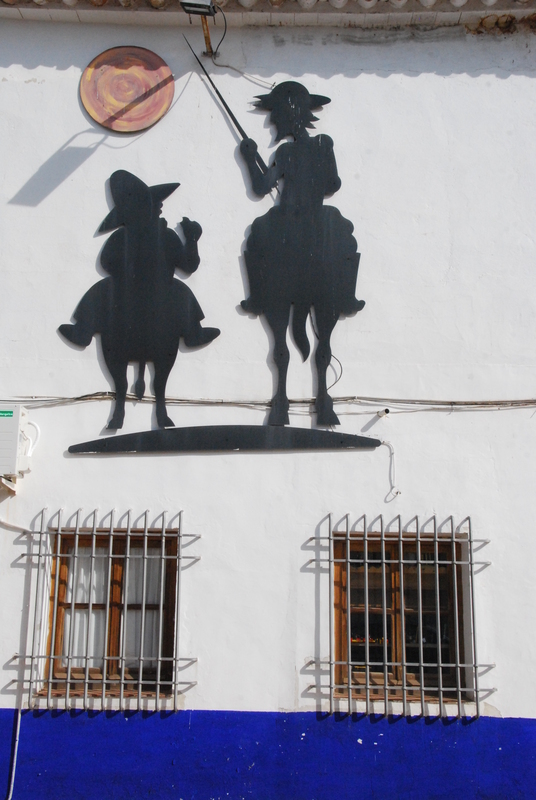 In Australia, it is the bushranger Ned Kelly; in Spain – or at least in the southern region of La Mancha – it is Don Quixote. As we travelled through the landscapes of Miguel de Cervantes’ fictional hero and his sidekick Sancho Panza, Don Quixote was everywhere. Cervantes’ book, written in 1605, has become a much-translated classic. In 1995, UNESCO introduced World Book Day on May 23, the date that Cervantes’ death in 1616 is celebrated annually in Spain (coincidentally, also the dates of Shakespeare’s birth and death). Don Quixote was a dreamer, “tilting at windmills” (attacking imaginary foes), while his companion Sancho was grounded in reality. 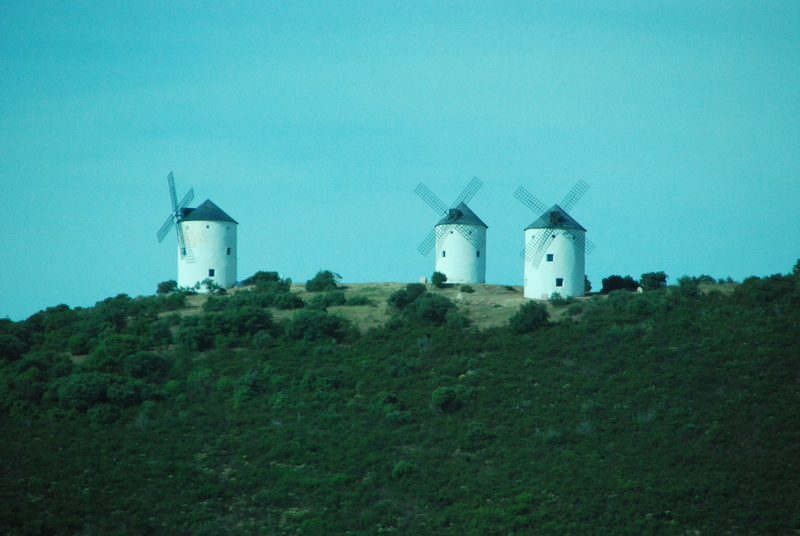 And along with many images of him as we travel, we also begin to encounter real windmills. Once used to grind grain, windmills are now obsolete but in Spain they are protected by law in order to save the few still left standing. If they are on private land, they must be restored, our guide tells us, with the Spanish government providing a subsidy of anywhere from 35 to 100 per cent of the cost. This has resulted in many derelict windmills rising again to adorn the landscape. There are other windmills too. Huge wind turbines stand atop hills as we drive through southern Spain, a visual reminder – along with fields of solar panels – of Spain’s investment in clean energy. But it’s lovely to see, on the hillside outside the village of Puerto Lapice, where we stop for morning tea one day, three old-fashioned windmills restored to their former glory. There were once nine windmills along this ridge, we’re told, with those still able to be rescued rising again progressively. Perhaps it’s time to re-read Don Quixote. I’m putting it on my “to do” list. Nice story. How is far north Qld? Thanks Caroline. Finishing off the Spain blogs before writing the North Queensland pieces (but yes, it’s lovely).